Kingtronics is a Hong Kong based manufacturer of electronics components. It was founded in 1995 and now has 2 factories in mainland China with over 800 workers. Thanks for the trust and support of customers. We also do some love activities every other quarter to give back to the society. 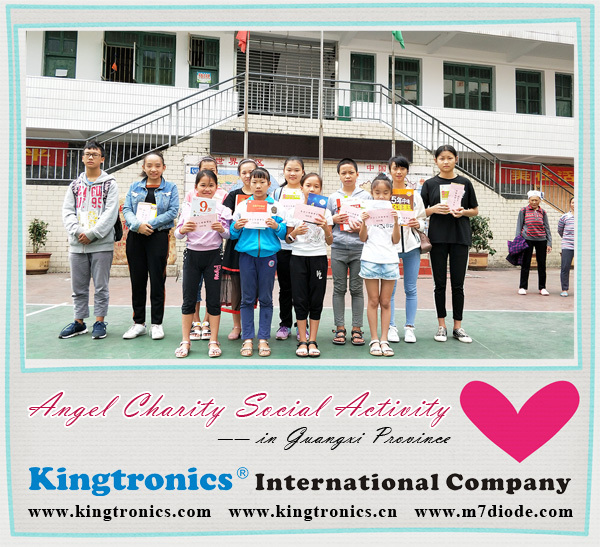 This quarter, we visited some children in Guangxi Province. Our boss and manager carefully choose some gifts to the children depend on they needs such as extracurricular picture book, study counseling books, new clothes, pencil case and schoolbag etc. Also we donated some money to school, which as an award funds for children. And then, we were talking with each other including share the feeling or knowledge and taught children some life tips to protect them. We hope children feel more confidence and study hard, and then deliver the love to other poor people. Because of a lot of strangers need warmth, love need, we should give more people-friendly.